LAS VEGAS – Oct. 10, 2017 – Barrett-Jackson is filling its 10th Annual Las Vegas Auction docket with some of the rarest and most coveted supercars that will cross the block Oct. 19-21, 2017, at the Mandalay Bay Resort and Casino. The world’s most desirable marques will be well-represented during the auction, including Ferrari, Lamborghini, Porsche and Mercedes-Benz. Among the most anticipated is a ’15 Porsche 918 Spyder (Lot #750) that is the world’s only hybrid model painted in Voodoo Blue. Among the hotly anticipated supercars starring on the Las Vegas Auction block is a ’15 Porsche 918 Spyder (Lot #750). 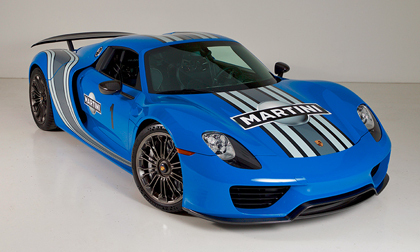 It is the world’s only 918 Spyder painted to code from Porsche Germany in breathtaking Voodoo Blue. Its hybrid V8 engine, with separate electric motor, produces 887 horsepower and runs 0 to 65 in 2.5 seconds with a top speed of 217 mph. One of only 918 built, this Porsche has been the centerpiece of the Rock and Roll Car Museum in Austin, Texas, and has less than 1,200 miles. Two highly sought-after Ford GTs will also look to steal the show, including a 2005 Ford GT (Lot #755) that is #1,890 of 2,022 build in 2005, and #488 of 503 manufactured in Centennial White. It has just under 11,000 actual miles with a 5.4-liter engine and 6-speed manual transmission. Also set to cross the block is a 2006 Ford GT Heritage Edition (Lot #749) that is one of 343 Heritage Editions produced and one of only 2,011 GTs produced in 2006. It features a supercharged 5.4-liter, 550hp V8 engine, 6-speed manual transmission, BBS lightweight forged aluminum wheels and a McIntosh stereo. 2008 Ferrari 599 GTB (Lot #756) – Finished in black with a tan interior, it is loaded with options and powered by a 6.0-liter engine and 6-speed manual transmission. 1986 Ferrari Testarossa (Lot #706) – A classic Italian sports car equipped with a 12-cylinder engine with 5-speed manual transmission and has been stored in a climate-controlled garage. 2007 Lamborghini Gallardo Spyder (Lot #727) – Finished in stunning high-gloss Giallo (yellow) with double-stitched black and yellow leather interior that sprints from zero to 60 in 4.3 seconds. 1997 Lamborghini Diablo VT Roadster (Lot #763) – Finished in rare Rosso Red and powered by a 12-cylinder engine mated to a 6-speed manual transmission, with just over 17,500 actual miles. 2005 Mercedes-Benz SLR McLaren (Lot #735) – With just under 7,500 actual miles, this supercar demonstrates the best in luxury driving and boasts a 5.5-litersupercharged V8 that pushes out 617 horsepower. 2005 RCR Superlite (Lot #731) – This mid-engine supercar was built and designed in Detroit with contributions from Formula 1 engineers and has just over 200 actual miles.